February 23, 2016, 11:44 AM · In an effort to promote the coverage of live violin performance, Violinist.com each week presents links to reviews of notable concerts and recitals around the world. Simone Porter performed the Barber with the Cincinnati Symphony Orchestra. 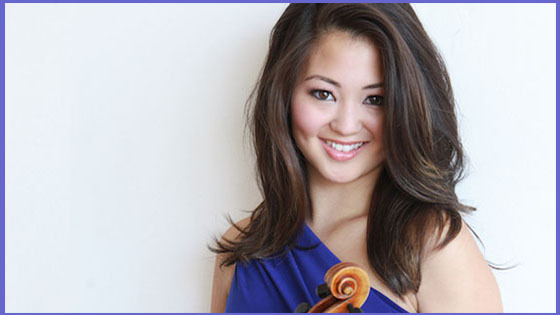 Cincinnati Enquirer: "The teen violinist stepped in at the last moment for the announced soloist, concertmaster Timothy Lees, who is nursing a stress injury, and delivered a ravishing performance....She played consistently with singing tone, beauty of line and expressive phrasing, at times turning to communicate with the orchestra. The finale was a lightning-quick, and she tossed off its explosive fireworks, smiling all the while. It was an electrifying performance that made you feel lucky to witness." Simone Porter. Photo by Jeff Fasano Photography. Hilary Hahn performed the Sibelius with the Minnesota Orchestra. Star Tribune: "Hahn, who last performed with this orchestra in 1998, gave the kind of performance Thursday morning that many have come to expect from her: refined, elegant, with great textural variety and technical command, and always utterly devoid of sentimentality. Her especially soft phrasing of the ethereal opening passage created a magical, otherworldly aura. The precarious high leaps in the first-movement cadenza were attacked with amazing perfection, and the mercurial third movement, once described as a “polonaise for polar bears,” had a dancing elegance." Song of the Lark: "Her collaborative attitude was obvious from those very first notes of ethereality. I’ve never thought of Hahn as a player who prioritizes dynamic contrast. But the Minnesota Orchestra under Osmo Vänskä does, so for that famous whispery opening, she adapted brilliantly by playing on a single hair, and it was mesmerizing. In the string-crossing and double-stop passages, she wielded a beautiful scuffiness of tone, a desperation of execution. She projected her sound brilliantly; she never fought to be heard. And when the orchestra swelled up for their solos, turbulent themes roiling all around her, she turned to look at each section, absorbing, maybe marveling at it all." Augustin Hadelich performed the Tchaikovsky with the Bournemouth Symphony Orchestra. Daily Echo: "His exceptional talent shone throughout as he gave every ounce of himself to the music, living up to the high praise and quotes about the beauty of his playing “revealing something from a plane beyond ours” (Washington Post)"
Gloucestershire Echo: "If Hadelich lacks the ultra-powerful tone of some soloists, his projection was more than adequate and he came fully equipped to deal with whatever Tchaikovsky throws at him. It was possible to marvel at his formidable bowing arm, his co-ordination, and, for example, the whirlwind octaves that swept from the bottom of his fiddle to the top and back, at the end of the cadenza." Nikolaj Znaider performed the Nielsen with the San Francisco Symphony. San Francisco Chronicle: "His playing was forceful and a little raw-boned, giving just the right impression of challenges faced and overcome." Examiner.com: "Throughout the entire concerto Znaider’s execution stood consistently on solid technical ground while also teasing out all the rhetorical gestures necessary to convey the soul of his instrument, so to speak." San Jose Mercury News: "Znaider, an artist of uncommon insight and faultless technique, approached the score with a brilliant mix of verve and clear-eyed focus." James Ehnes performed the Beethoven with the Sydney Symphony Orchestra. The Sydney Morning Herald: "When it all comes together, the piece becomes a profound expression of humility and radiance that few fail to respond to. In this case, it also had the extraordinary beauty and immaculately smooth sound that Ehnes draws from the Marsick Stradivarius violin that he plays. It has an elusive balance of colour, glow, firmness and sweetness that falls on the ear like the finest white wine you could imagine would fall on the palette. One could easily become addicted." Alina Ibragimova performed Haydn's C Major Violin Concerto with the Boston Symphony Orchestra. Boston Globe: "Ibragimova’s playing was gleaming and beautiful, but also rather objective, as though she were observing the concerto’s Passion drama rather than enacting it from within. Only during the third movement, a barbed scherzo, did a fully expressive sense of anguish materialize; elsewhere her playing lacked some of the bite the music seems to demand." The Boston Music Intelligencer: "The solo violinist, Alina Ibragimova, a native Russian who now lives in England, appearing for the first time with the BSO, proved herself fearless as well as deeply sensitive in this work." Robert Chen performed the Respighi with the Chicago Symphony Orchestra. Chicago Classical Review: "Robert Chen’s slender, silvery timbre and intimate expression proved well suited to this rhapsodic music, and the CSO concertmaster played with pure tone and unfailing sensitivity. One would have liked a bit more fire and intensity in the final movement’s bravura sections where the solo playing felt too laid back, especially next to the unbridled energy and cinematic sweep of Honeck’s hard-charging accompaniment." Stefan Jackiw performed Prokofiev's Violin Concerto No. 2 with the Illinois Philharmonic Orchestra. Chicago Classical Review: "The soloist’s playing was musically astute from start to finish, delivered with a shimmering tone and flawless technique." Jennifer Frautschi performed the Mendelssohn with the Boston Philharmonic. Boston Globe: "Mendelssohn’s familiar Violin Concerto, from 1844, is prone to glossy, sweet-tempered performances. Frautschi, a Brookline resident, made the piece personal with an incisive tone and subtle phrasing." The Harvard Crimson: "Soloist Jennifer Frautschi ’95, a graduate of both Harvard and the New England Conservatory, received a standing ovation for her rendition of the work." William Shaub performed Praeludium and Allegro and Zigeunerweisen with the Canton Symphony Orchestra. ClevelandClassical.com: "Shaub plays a violin made in 1865 (by Jean-Baptiste Vuilliame), and in hearing its unusual depth and warmth, there was an uncanny sensation that he was drawing out and communing with all the music that has ever imprinted itself on its mellowed grains. His unquestionable virtuosity was especially bedazzling in his effortless and witty grasp of the brisk, challenging Sarasate work." Rebecca Reale performed Mozart's Violin Concerto No. 5 with the New World Symphony. South Florida Classical Review: " With expert bow control and dead-on intonation, she played the first movement in an effortless manner that expressed its essential lightness." Dale Barltrop performed the Barber with the Melbourne Symphony Orchestra. The Sydney Morning Herald: "Co-concertmaster Dale Barltrop intensified the program's summer-suggestive richness as soloist in Barber's Violin Concerto, giving a balanced performance that emphasised the composer's masterful melodic gift, here speaking a language of humane warmth and poise at its most eloquent in the lyrically memorable opening allegro." February 24, 2016 at 03:18 PM · Nobody plays on a single hair. And how does one wield a desperation of execution without fighting to be heard? But truthfully I did find the whole of the linked review quite enjoyable. That "Song of the Lark" blog is a fun one.